It’s hardly new news – but digital disruption is now top-of-mind in practically ever sector. You probably have your own favourite stats on this issue. Here are mine. 63% of industrial players and 81% of tech companies are experiencing significant disruption, or are expecting it within 12 months. (Source: Russell Reynolds Associates). As an organisation moves forward with its digital transformation project, one key topic can easily get overlooked amongst all the discussions on strategy, technology and business processes. Because at the heart of digital transformation is a leadership and people question: How will our people live this digital transformation – and how can we instill the necessary values, mindset and practices? I spend a lot of time helping businesses work through the people, cultural and leadership issues that hold back digital transformation. Here are 7 people issues that companies who are serious about genuine digital transformation will need to navigate. Firms who have led their category for many years often find they have evolved a stable, fairly hierarchical culture. The corporate ‘machine’ has been fine-tuned to the old environment, but employees do not fully appreciate the scale of the change that’s about to hit their industry. As the head of digital transformation at a large media firm said to me, “we need to destablise our teams”. In other works, teams who were ‘unconsciously competent’ in the previous era are often ‘unconsciously incompetent’ in the digital era. >> BONUS: Assess your team health here! The question: How aware are our teams of the scale of the challenge ahead – and how committed are they to being part of the solution? There is often an understanding that digital natives (millennials) will be able to bring some necessary dynamism, flexibility and digital-awareness – and shape the corporate culture. However, in many cases companies struggle to attract digital natives – and struggle further to meaningfully integrate these young professionals into the business. Often we hear senior leaders bemoaning the lack of commitment of the Millenials. Putting another take on it, one could say they’re no longer willing to put up with bad management in the short-term in the hope of a long term pay-off. They’ve probably seen too many people laid off to put their hope in that. The question: Are we asking digital natives to simply ‘play on our turf and by our rules’ – or are we involving them in actively changing how we operate? This is related to the previous point. What kind of leaders is your leadership pipeline producing? Very often, the selection, promotion and development process hasn’t changed and continues to deliver more of the same kind of leaders that the company has been used to. Your current leadership is a byproduct of your company culture. And, as leaders define culture, it’s actually more accurate to say the current culture is a byproduct of the company leadership. Now, it’s hard for leaders to welcome into their ranks those who represent a very different mindset, values and outlook. But existing management must become sufficiently self-aware to integrate ‘digital leaders’ into the mainstream if a bridge is to be build from the previous culture to a more digital-ready one. The question: Is our leadership pipeline producing leaders who are comfortable with digital business models and who can build loyalty in rapidly changing, diverse and disperate teams? Digital transformation requires asking major organisations (Product, Marketing, Technology, Supply Chain/Operations) to step up into more transformational roles. Similarly, it’s dependent upon agile techniques that require business and technical teams to tightly collaborate. However, many organisations have worked best up and down the chain of command, whereas working across divisions has often been difficult. The leaders of the future can no longer trade on IQ (competency and knowledge). IQ is table-stakes, but EQ (emotional intelligence) really determines the ability to get things done outside of the command-and-control hierarchy. The question: Do we have enough leaders with the EQ to effectively make things happen across the entire organisation? Do we have a systematic, effective mechanism to grow EQ and collaborative skills? One of the biggest impacts of the digital age is how the notion of ‘team’ is being redefined. Previously, teams were stable, long-term, within a functional hierarchy and often geographically colocated. Now, teams are short-term, cross-functional and geographically dispersed. In this environment, all the old rules for building high-performing teams are being rewritten. Companies need to help new teams to form, establish and rapidly start delivering at high levels. In our experience, the best way of doing this is to create a consistent leadership culture and a common leadership language across the company. In this way, new teams can quickly come together. Because everyone has shared frame of reference, similar values and common expectations, teams can rapidly form, build trust, and start delivering results. The question: Do we have a clear leadership culture that is lived out by 90% of our team leaders – enabling the rapid and stress-free formation of high-performing, short-term teams? Many digital transformation initiatives are – let’s face it – leaps into the unknown. Some elements are known, but a lot needs to be figured out. Many leaders are comfortable with this level of ambiguity, but our research shows that around 70% of employees find it extremely difficult to operate in this environment. Fear, uncertainty and doubt emerge and the organisation fails to perform at the necessary level. It is the role of the leaders to keep the organisation together during what will be a difficult period of uncertainty and turbulence. This involves effectively communicating the vision so that the more pragmatic and less visionary staff can engage. It also requires hard-driving managers to increase the level of support and empathy for their staff – something that many will find extremely counterintuitive and difficult to deliver. The question: Do our team members feel their manager is for them as we go through this digital journey, or do they feel they are expendable pawns on the digital chessboard? One of the issues we see time and time again that firms fail to create the entrepreneurial, experimental initiatives they understand they need. This often comes down to a question of WHO. Each organisation has natural pioneers and innovators, but whose natural strengths have often been surpressed in the risk-aversion of business-as-usual. The key is to draw out these innovators in both the mangement and execution levels of the organisation – and set up governance structures that actually ring-fences this activity from the interference of the “safe pairs of hands” who are probably successfully managing the traditional lines of business. The question: Who is specifically being asked to govern, and deliver on, innovation – and is this mandate in line with the actual skill sets and temperament of the people involved? In conclusion, then, ‘soft is hard’. It turns out that people and cultural issues hold back digital transformation far more than technology, processes or business models. Leaders who are serious about adoption and sustained change will systematically address these issues before they cause the initiative to underperform and, ultimately, fail. 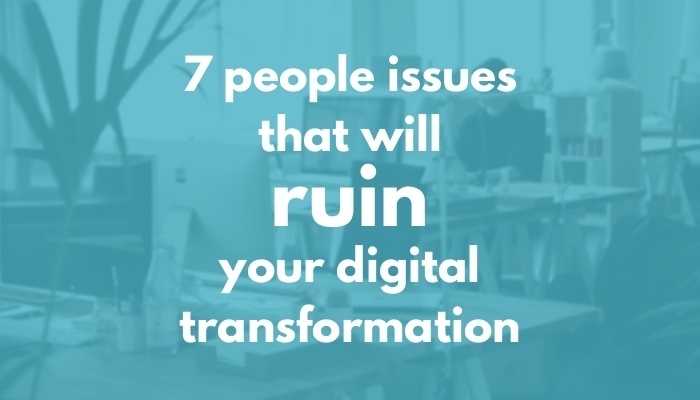 What are the 1-2 top people issues that you are encountering in your own digital transformation efforts? Do let me know. The next wave of technologies like AI, Conversations, AR/VR, IOT are going to completely revolutionize the engagement journey once again. Enterprises that focus on a unified stakeholder engagement strategy (Internal and External vs External and Internal) would reap better returns on their investments and see happier employees focused on the market and customers and make them their ultimate promoter and brand champions.